The writing is on the wall about Gerald McCoy’s future with the Buccaneers and many fans aren’t going to like it. Plus, the Bucs are making a free agent move this week. The NFL coaches meeting is this week, and rule changes are abound. We discuss the first passed this week. We’ve also got a sneak peek on what Cam Newton is doing this offseason! Are you as ready for football season as we are?? Join us while we kill some time talking our new coaches, new acquisitions, and the Kardashians (yes, for real). While we’re at it, we’ll butcher some names! Only 132 days until preseason…. In this episode, Molly and Ralph go over the latest roster moves with the Buccaneers and some things we saw on game film with Shaquil Barrett. We cover the latest news about the Bucs including the hiring of two female assistant coaches. Then Molly dives deeper into the moves our enemies have made during the offseason. Two days into free agency, and there have been some rumblings at One Buc Place. Ralph and Molly discuss, plus notable transactions around the league. We’re wallowing for some of our fallen Buccaneers today as the legal tampering period of NFL free agency comes to a close. Our thoughts on the loss of Kwon, Humpries, DeSean Jackson, Bryan Anger and more. We also discuss moves the Bucs have made thus far. Check out the new Magnus Rush app to listen to podcasts! It has Easy Actions, ratings, Voice Messages, Shout Outs, and Tips! Download it at the iOS App Store or Google Play Store now. To absolutely no one’s surprise, the Saints are still nursing their butthurt after losing the NFC Championship. Find out which part of the team is getting a revamping, and how they’ll fare in free agency. Check out the new Magnus Rush podcast app! It has Easy Actions, ratings, Voice Messages, Shout Outs, Tips, and more! Download it at the iOS App Store or Google Play Store now. As we anticipate the start of free agency, Bucs news is fewer and further between. We go over what little tidbits there are in this episode. Donovan Smith was re-signed by the Buccaneers for a 3 year contract worth $41,250,000, including $27,000,000 guaranteed. That comes out to an average annual salary of $13,750,000. Is it worth it? Did the Bucs do the right thing? 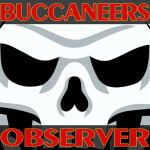 Molly and Ralph discuss it as well as other Bucs news.